All the information stated in this manual is subject to change without any prior notice. Vidya Mantra EduSystems Pvt. Ltd. reserves all the rights to modify the publication and content anytime without notice to any person. Vidya Mantra EduSystems Pvt. Ltd. does not provide any statement or warranty on the content of this manual. All Rights Reserved © 2018 Congrea. No duplication of this user manual is allowed without the written consent of Vidya Mantra EduSystems Pvt. Ltd. This manual has been designed to explain the user interface of Congrea as well as how to use its different features. 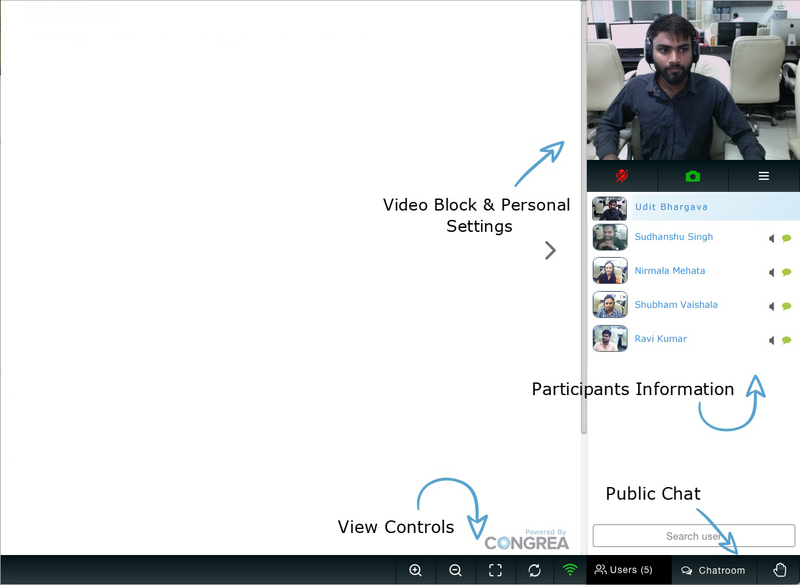 Congrea is a new generation scalable, open source online virtual classroom environment. It has been packaged with several value added features such as, audio-video interaction, chat, poll, quiz, collaborative editor and much more. Congrea also enhances the user experience by allowing the users to share media, documents or even screen with their fellow participants. It has been designed to enable real time knowledge flow in all the categories of institutions such as, school, college and corporate organizations. Its unique feature of getting integrated with other software makes it an easily acceptable and reliable product. Moreover, Congrea provides a safe platform to its users, as all the end to end communications are encrypted via SSL. Being an open source application, Congrea is highly customizable and can be modified according to the different requirements of the user. It’s a lightweight, browser based application and has no dependency on Flash. Also, Congrea’s cloud services are offered from twelve different locations across the globe. *Note- If a person owns a system (e.g. Laptop) wherein the build in camera is either damaged or its picture quality needs to be enhanced then the person will have a choice to add in another external camera to the system which can be enabled in the settings section of Congrea. Before understanding the UI one must note that Congrea is meant for two type of users, i.e., presenter and learner. Presenter will be the person, having all the access over the different features of the application, However, learner will have limited access as well as different look and feel of the application. Once you login to Congrea as a learner, you will land to a page which will look like the screenshot below. The Bulk User Action section will have the options to enable/disable the audio and video access for learners. In the Media section you can change the audio input, audio output and video input. Your presenter may allow you to participate in the collaborative text editing session. Once permitted you can use the toolbar and can write anything over the text editor, you can also choose font, size, colour and alignment of the text. To add a picture just click on the Image icon present on the toolbar, add the URL and click submit to upload it. Presenter can run a poll anytime during the classroom session. However, you will get notified before it gets started. The closing of poll can be either controlled via instructor (presenter) or by a preset timer. If it says that “teacher may close the poll anytime” then it is being controlled through the instructor, else via timer. The Presenter can also run a random quiz which you will get notified before it starts. The questions presented will be in multiple choice format. After clicking the answer of a question you can click next to view other questions of the quiz. You can also change your answers by clicking on the question numbers present on the top.